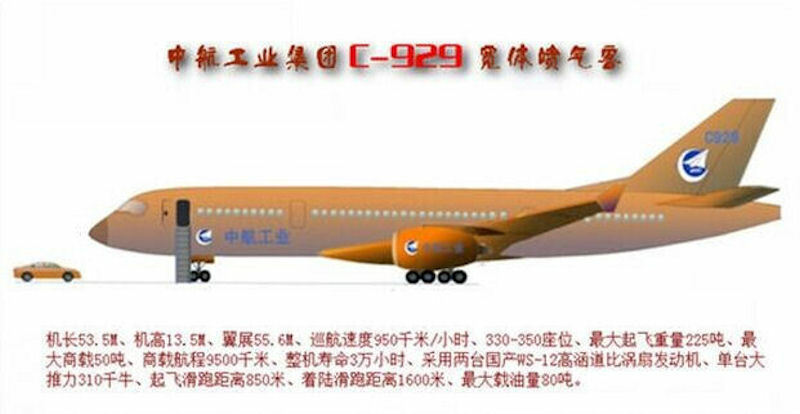 The wide-body commercial jet co-developed by China and Russia was named CR929 on 29 September 2017. The jetliner is jointly built by Commercial Aircraft Corp of China (COMAC) and Russia's United Aircraft Corp (UAC). The letter C and R stand for China and Russia respectively, 9 is the largest single number and means long-lasting in Chinese, and 2 refers to the two parties working together in developing the aircraft. 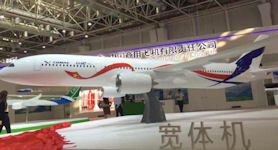 The wide-body commercial jet being developed by China and Russia, aiming to replace the Boeing 777 in the future, is expected to be delivered in 10 years, as early as three years after its first test flight, according to a timetable announced 02 November 2016 by domestic plane manufacturer Commercial Aircraft Corp of China. By mid-2018 the CR929 widebody had grown and required greater thrust than envisaged at program in 2017. An engine type generating 78,000 lb. thrust is now needed; in 2015, thrust per engine was 71,226–75,000 lb. Comparable to the Airbus A330-900 in the 2015 concept design, by 2018 it was approximately the same length as the Airbus but had a wider fuselage, enough for nine-abreast economy seating. The aircraft is now 63.25 m (208 ft.) long, according to Sukhoi, just 45 cm (18 in.) shorter than the A330-900. The Russian company did not give the width of the fuselage, but for the preliminary design described by Comac the figure is about 5.9 meters. Bradley Perrett and Maxim Pyadushkin, writing in Aviation Week & Space Technology, 23 May 2018, reported "Span has apparently risen in at least two steps: in the design described by Comac it is in the upper half of the 58-61-m band planned in 2015; in the design detailed by Sukhoi, it is well beyond that band. Indeed, at 63.86 m it is barely less than the values for the A330-900 and A350." 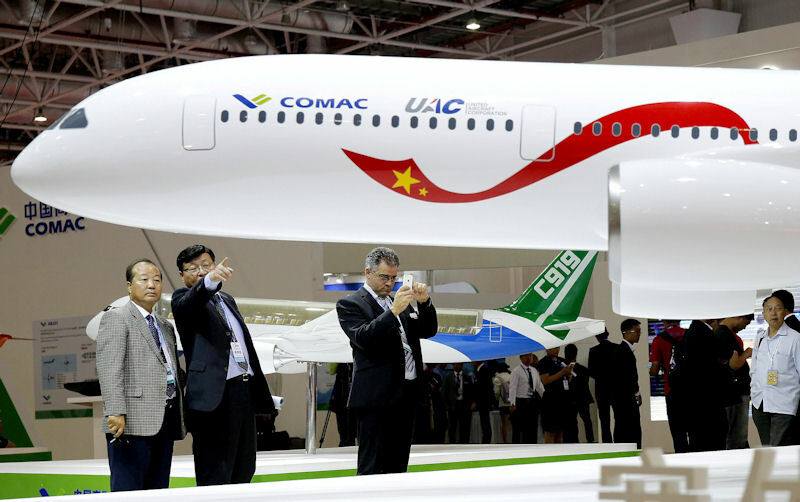 COMAC, which based its prediction on past research and manufacturing experience, issued a statement saying that the company and Russia's United Aircraft Corp have set up a Shanghai-based joint venture to develop the jumbo jet. The company was expected to start operating by the end of 2016. The project signalled the two countries' ambitions to compete in the wide-body market, dominated by United States aircraft manufacturer Boeing Co and Europe's Airbus Group. 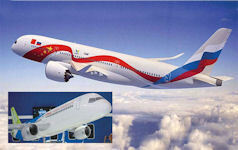 Research and development for the new jet will be conducted in Moscow, with assembly in Shanghai. "It is hoped the development of wide-body aircraft will drive the growth of many related aircraft manufacturing sectors like building engines. China will be able to learn and apply the experiences of Russia, enhancing the manufacturing level of the nation's aviation industry," said Li Xiaojin, a professor at the Civil Aviation University of China in Tianjin. "China is about to start manufacturing wide-body aircraft, which have high standards in terms of aircraft engine technologies and aircraft materials," he said. "China and Russia still face some difficulties in making competitive wide-body jets given their current manufacturing levels." Witnessed by President Xi Jinping and his Russian counterpart, COMAC and UAC signed a pact in June to co-develop a wide-body jet. The 280-seat wide-body jet would have a range of 12,000 kilometers. 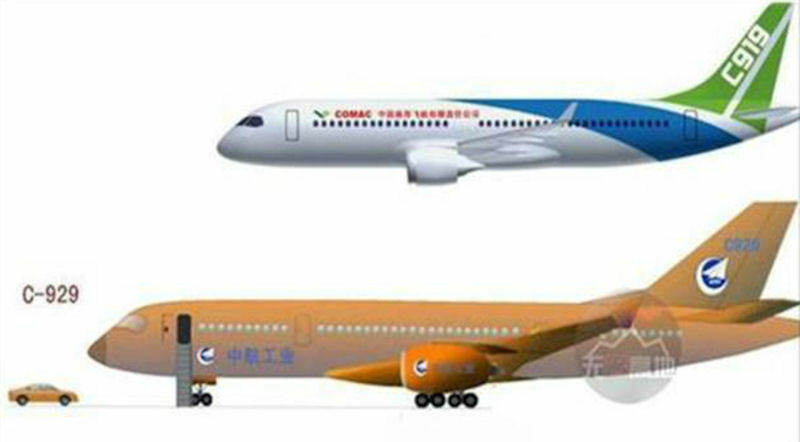 It would be an economical and efficient jet incorporating heavy use of composite materials, according to COMAC and UAC. 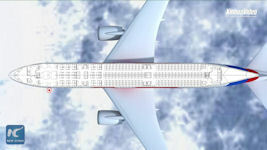 They also plan to develop longer and shorter series of wide-body jets to complement the basic version. "The direct costs of our wide-body jet will be 10 percent lower than those of peer aircraft. That's among our research and development goals," said Guo Bozhi, director of wide-body project at COMAC. The company targets the global market and will boost competitiveness in a fragmented market, Guo added. The Commercial Aircraft Corporation of China Ltd. [COMAC] is the Chinese state-owned corporation specializing in passenger plane development. The company started its operations in the spring of 2008. The company started working on a few models of aircraft - the single-aisle aircraft «ARJ21» and «C919», designed for short and medium-haul flights and with a seating capacity of up to 105 and 190 people respectively. In the future, the company plans to implement a more "heavy" projects - to produce twin-engine wide-body airliners - «COMAC C929» (with a capacity of up to 290 people) and «COMAC C939», which will be able to provide a comfortable flight for up to 390 passengers simultaneously. The C919 single-aisle airliner is a very ambitious project for COMAC. But it is just the start. As part of its long-term plans, the company also has its sights set on the twin-aisle market with the C929 and the C939. In fact, COMAC’s long-term goal is to capture one-third of the domestic market by 2030. C is the first letter of China, the first letter is also China Commercial Aircraft Co., Ltd. abbreviation COMAC, that is determined to be among the major international passenger market, to the Airbus (Airbus) and Boeing (Boeing) together with the international ABC pattern side by side in the form of large aircraft manufacturing. The first "9" the implication is forever, where "29" maximum capacity of representative of this model is about 290 passengers. China's civil aviation fleet will triple to 6,450 aircraft over the next two decades, and Chinese airlines will grow faster in the international market than in the domestic sector, Boeing Co said on 06 september 2013. China will need 5,580 new aircraft valued at $780 billion during the period, the United States-based plane manufacturer said in its market outlook. Growth in the long-haul segment was expected to result in demand for an additional 1,440 new wide-body aircraft in China by 2032. According to Russia's United Aircraft Corporation (UAC), the demand for wide-body aircraft can be about 8 thousand units by 2033, with 7 thousand passenger aircraft. More than a half of total demand in wide-body segment, about 4 thousand units, in the long term consists of Asia- Pacific market. About one thousand aircraft can be claimed for the Chinese market, according to the corporation. The fast-growing domestic civil aviation market is forcing Chinese airlines to use wide-body aircraft to carry more passengers on high-traffic routes between Beijing, Shanghai and Guangzhou. Narrow-body aircraft, which are often used on domestic routes, limited the main airports' growth in passenger throughput, as few additional slots are available at the airports. Airbus SAS announced the A330 regional project at the Beijing Air Show in September 2013 with a new, lower-weight variant of its wide-body product — the A330-300. It's the first time that the aircraft manufacturer has launched a new project in China, which will be one of the most important markets for the A330 regional. The A330 regional has 400 to 440 seats, while the standard layout of the current A330 has only 300 seats. The new version would be operated starting in 2015. By 2013 the Commercial Aircraft Corp of China Ltd was doing market research into the wide-body market and was waiting for authorities' approval of its own project. 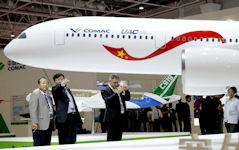 The entire wide-body fleet in China will reach 1,062 by 2032, COMAC said in its market outlook. The Chinese airframer had initially planned on developing a 250-seat jet, but discussions with various airlines found the demand for a 300-seater to be stronger. The plan was for a wider use of composites instead of aluminium. It is also studying what range the aircraft should have, with options in the 6,500nm and 8,000nm range. Commercial aircraft Corporation of China websites 2014 new year message stated : "Under the strong leadership of the Party Central Committee and the State Council, all cadres and workers to conscientiously implement, the spirit of the party's third plenary session... Adhere to the "Chinese design, systems integration, the global tender, gradually improve localization development" principle, adhere to the "independent research, international cooperation, international standard" technical line, adhere to the "innovation, entrepreneurship, and create" development philosophy, accelerate the construction of a world-class aviation companies, to create a company to secure development and stable development and rapid development of the new situation. Practice has proved that the Party Central Committee and the State Council to develop large jets projects on major strategic decisions are correct... Party leadership's working style of the company presents a new style. Company party and carry out the party's mass line and educational practice, with good style for large aircraft development.... "
The objective of a first flight of the new widebody in 2023 should be regarded as firm. By 2020, the CR929 aircraft is expected to receive orders, according to a three-year plan for bolstering China's aviation manufacturing industry released by Shanghai local government in May 2018. CRAIC anticipated deliveries of the aircraft to begin in 2026.